Is Christianity just about “going to heaven when you die”? If so, what exactly is the purpose of our life here? What does it matter what we do here and now if everything will be destroyed in the end? Ought Christians believe we will be better off when our bodies and the material world are done away with? N.T. Wright argues in Surprised by Hope that none of these are in fact true reflections of the Christian faith despite their popularity, even within Christian circles. 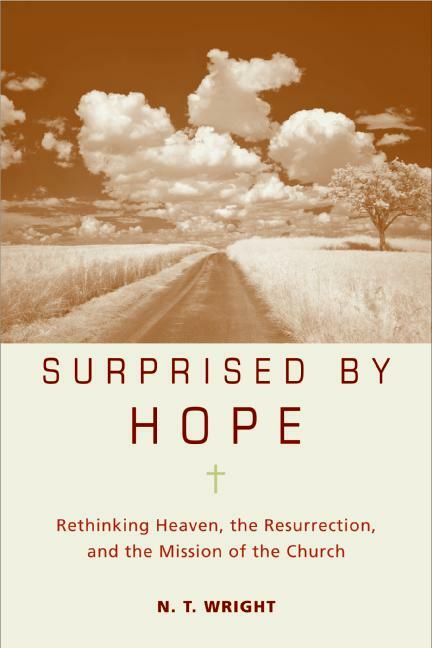 Wright wants to help the church recover the hope of the early church – bodily resurrection and the new creation – and by doing so, also recover a robust passion for the importance of the church’s work in this world. This will be a different kind of review since I am far from the first to review one of N.T. Wright’s works and a summary of this book is not difficult to find. What I hope to contribute here, then, is the one unique thing I certainly can contribute, that is, my own reaction to Surprised by Hope; a reviewcoming from my own background, community, theology, etc. Some approach Wright hoping to trap him in his own words or discover his latest “heretical” claim. Others come to him with a certain reverence, as if he is a John the Baptist, a lone prophetic voice crying in the wilderness. I read Wright to see what the fuss was about. For a number of years I had been wary of Wright due to the warnings of others, but since then have found some of his ideas being supported and restated by scholars that I respect. So it was high time to read one of them! Surprised by Hope is an odd book. I say this because I’ve not read a book with which I so often agreed but then also rolled my eyes, often in the space of the same paragraph! I found myself nodding in agreement much of the time, sometimes even experiencing an “aha!” moment from time to time (those are always a joy). I’ll return to these in a moment, but I must also mention that Wright has a knack for controversial statements. Sometimes this is just his rhetorical style, but other times he goes farther. For an example of the latter, Wright sees no reason to discourage prayers being made to the saints, despite the fact he earlier disapproved of the idea of saints praying for us because it was ‘unbiblical! This is not the only odd statement of Wright’s. Hell isn’t taught by Jesus; the references to Ghenna are Jesus discouraging earthly attempts to establish His kingdom by warning that the Romans would squash it and turn Jerusalem into a trash heap. Leaving behind many of the traditional ‘hell’ texts, Wright’s own presentation is then based upon his reasoning, not Scripture. Once he sets up a position somewhere between the traditional view of hell and annihilationism, he then rebukes Christians for holding a position based on their own vindictive emotions into their view of hell! Is Wright free of imposing his own emotions into his position on hell? Wright also denies that Jesus taught about His second coming (holding a partial preterist view), that remained a task for the apostles’ later teaching. This list could be multiplied, but this small excerpt will do. On the other hand, I appreciated much in Surprised by Hope. Wright’s emphasis on the early church’s hope for resurrection was very welcome. I wish more Christians would ‘get’ this point. The idea that our eternal state is in a heavenly place, without a physical body, floating in heaven, and so on, is not drawn from the New Testament! Our future hope is bodily resurrection, a new creation, a restoration of this world. God means to restore creation, not abandon it. Wright correctly shows that this point has important bearings on the Christian life. Our work here and now will not be for naught, “Belief in the bodily resurrection includes the belief that what is done in the present in the body, by the power of the Spirit, will be reaffirmed in the eventual future, in ways at which we can presently only guess” (Kindle Location 2513). What we do in this life indeed carries on to the next. This impacts our idea of mission. Wright holds that two extreme views are common: a complete avoidance of cultural engagement, seeing it as an obstruction to ‘soul-winning’, or an overindulgence of mercy ministry at the lack of calling individuals to salvation. I read a portion of this book while we visited my father-in-law on a business trip in Dublin, and so – as you do – I watched a nature documentary on the hotel TV. In this program a man was trying to better understand meerkats. Some Christians would see this as a complete waste of time but I’ve always been uneasy with the unfortunately pervasive disdain for creation-care; often it is seen as a distraction from winning souls for heaven, but Wright shows this is a false dichotomy. We do both. I would want to talk to Wright about how we balance the importance of these two tasks, or if one is more central than the other, but he is right to insist that if what we do in this life carries into the new creation, then we ought not reject taking care of our world. This flows into Christian engagement in culture as a whole. This world is not to be thrown under a bus, so we ought not to retreat from enjoying it and creating within it. God’s plan is not provide a way of escape from this wicked creation, including the escape from our evil bodies, but to redeem all of creation itself, including new resurrection bodies! This requires a change in perspective. However, I’m not quite on board with everything that Wright says on this issue. I am a little wary of him shifting the scales a little too far away from personal evangelism – after all, we want as many people as possible to not only be saved from temporal suffering, but eternal suffering, and what’s more, be reconciled to God and be part of the future resurrection of all things. It seems that every review of Wright is required to provide a pun on his name, so here is mine. The most difficult aspect of this review is as I mentioned above, a mixture of approval and disagreement. Sometimes Wright was wrong, sometimes he was right, but much of the time he was just wright. I would like to present a new word that helps explain a phenomenon that finds perfect expression in Wright. It is broader than him, but very common to him. It is this, one neglected truth is recovered, dusted off and elevated to its rightful position (or perhaps a little higher than it deserves), but in all the excitement of recovering that truth another truth (sometimes more important) is moved to a lower place, or perhaps unintentionally knocked behind the shelf altogether. Doing this is not purely wrong, nor is it purely right, but I would call it simply being wright. More often than being purely right or wrong, Wright is very often just wright. He is so determined to recover what he sees as a forgotten truth that sometimes another truth gets misplaced in the meantime. That reflects my main concern over this book. Much good is recovered and restored to a rightful place, but other good things are knocked off at the same time. Much of Wright’s correct ideas here are also reflected in the works of G.K. Beale or Jim Hamilton, who are more often just right and less wright than Wright, so I would direct the reader to also check out their works. Reading Wright, to me, is a little like reading C.S. Lewis. I am interested to see what he has to say about a given topic irrespective of whether I will agree with him or not. Wright’s prose is clear and enjoyable and his ideas are exciting if not always correct. Stimulating. Controversial. Frustrating. Exciting. Dull. Meandering. Moving. Refreshing. All of these words describe Surprised by Hope for me. I would certainly recommend itto anyone who is interested in reading something from Wright; I would just encourage them to push through the dull/meandering/odd parts to get to the real meat – of which there is plenty – while also being wary to not accept everything he says at face value.